For a lot of the solopreneurs and SMB owners, the term “content marketing” doesn’t have any real meaning. Maybe you’re the same way, unsure of just what this all means. But there is a process you can use to create outside the box content ideas. Take Rita Long for example. She’s an amazing artist, and I have several of her pieces in my home. We like to bat ideas around, and have a standing call every Friday morning to get the ideas flowing. Two weeks ago we were talking about a new idea for marketing. Rita wants to make it easy for interior decorators to sell her work, by helping them create room ideas around the artwork. 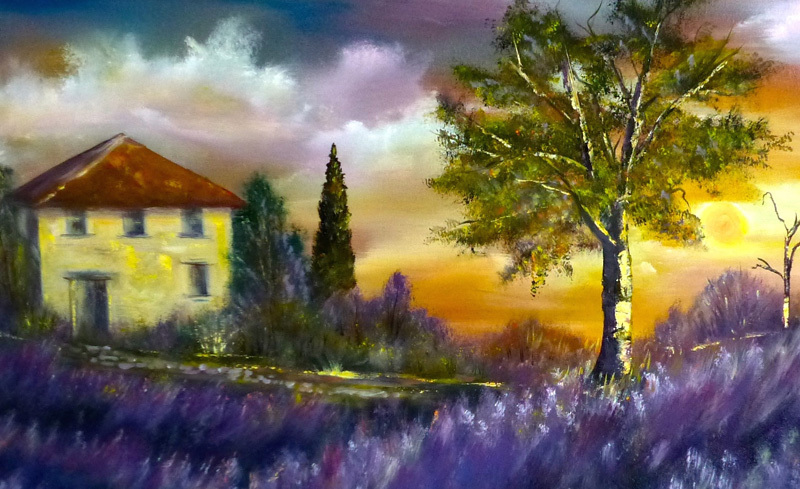 Lavender Fields, for example, is a beautiful oil on canvas inspired by Rita’s travels to the south of France. And it has the place of honor in my North Carolina dining room (no, it’s not for sale…but she does take commissions). I love the piece, and it’s inspired the rest of the decor for my main rooms. So we hit on the idea of making “swatches” for her paintings. The idea is to create a printed “swatch flyer” for each painting. On the flyer would be a copy of the artwork with three or four of the key colors highlighted and defined. Then we’d tell a little story about the painting, and how it might work in a particular type of decor. 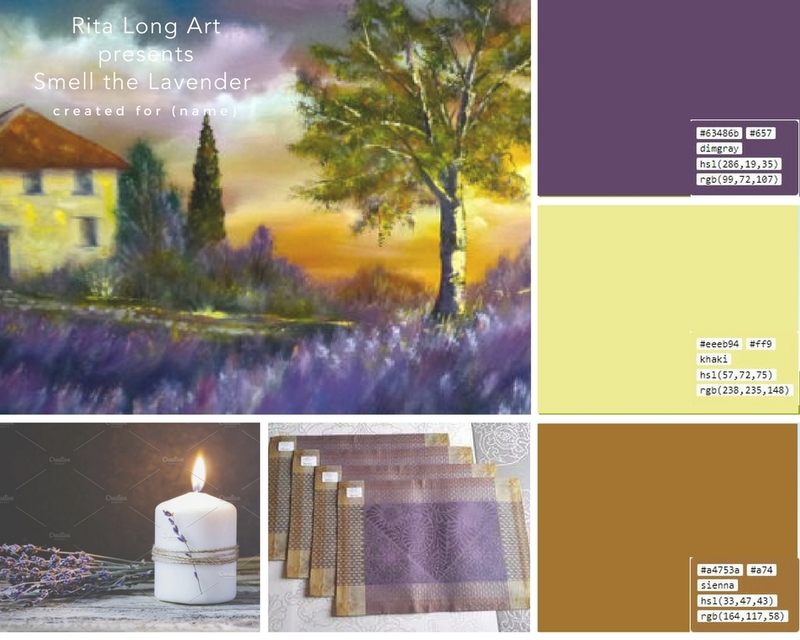 Rita can now use the swatch flyer, the video and this blog post to help sell her art. Gallery owners and decorators will be able to understand how she can work with them to help their customers. And that’s the end game we’re after in a B2B campaign like this. So, how did we get there? Let’s break it down. There’s really not much point in making marketing content if you don’t do this step. You have to know who you’re creating for, what they need, and how you can meet that need. Once you have that, the ideas start to flow. Rita and I spent maybe 15-20 minutes talking about decorators and and how they work before this idea bubbled up. Bat the ideas around. One conversation leads to another idea, then another. Give this process the respect it deserves. When you hit on an idea that you agree has legs, commit to taking it further. We agreed we liked the swatch idea. It went on the To-Do list right then. Put the initial ideas into some kind of format. If the content will be a long-form article, start with an outline. If it’s a design piece like Rita’s swatches, lay it out. You’re not looking for perfection at this point. The idea is to get enough of an idea together that you can see the holes. At this point, everyone should be able to see enough to get really excited about the idea. Fill the holes, add the copy, and remember your branding. No one I know gets it right the first time. Don’t be afraid to say “what if …” Of course, you have to know when to say when, or you could spend your life making tiny changes. But allow the process to run its course. Where can I use this on other channels? Can I make a video to share it? Would it work on Instagram? Maybe a blog post. 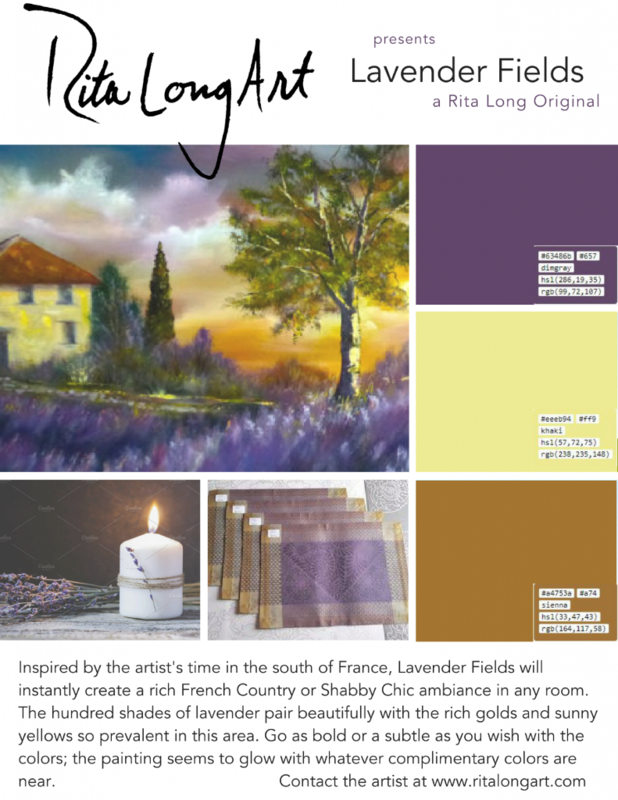 Maybe we’ll eventually put the swatches together into a book to give away to decorators (are you listening Rita? This could be great for getting commission work!) No piece of content stands alone. For a content strategist like me, this process is just plain fun. Marketing is only “work” if you approach it that way. Play with your ideas, don’t be afraid to offer suggestions or random thoughts. Once you hit on an idea that shines, see it through. I’m proud of Rita for taking this to the next step and doing the video. And I can’t wait to see the response when she gets it out in public. Content marketing is such a broad term that it can be hard to really see how it applies to a smaller business. Creating outside the box content can be done. It’s really all about the “stuff” you put out into the world — on digital or in real life — and how your audience will use it. If you’re like most SMB marketers, you’ve created a lot of marketing copy without taking the time to define your brand voice. And you’ve ended up with copy that doesn’t sound like you at all. An authentic voice is a wildly important part of your marketing strategy. But how do you define it? And how do you share it with the people on your team who need to know how to use it? We take Heald’s advice a few steps further, and use a thing we call the Five Question Process. It’s pretty simple. Each workday for one week, you answer one key question about your brand. You can answer them on your own if you’re a solopreneur, or get your team members involved for a wider view. Plan to spend at least 30 minutes on each answer. You want to really dig deep and give this some thought. At the end of the week, you’ll have about 80% of the tough work done to create a workable brand voice guideline you can share with your team. You’ll be ready to define, in just a few short paragraphs, what your brand voice stands for, sounds like and intends. And that information will absolutely transform your marketing. Ready to get started? 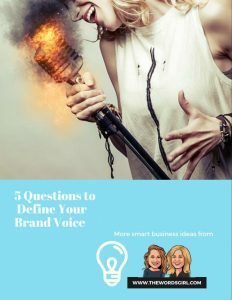 Download your copy of 5 Questions to Define Your Brand Voice today. Or contact us if you’d like to work together on this. Here’s to your authentic brand voice … and to more engaging content for your audience. The past few months, this one idea has been transforming my business as if by magic. Best business advice? Love the work, love every word you write, love every client (yes, even that client), love every task and challenge and success and setback. Love every invoice, and every payment. 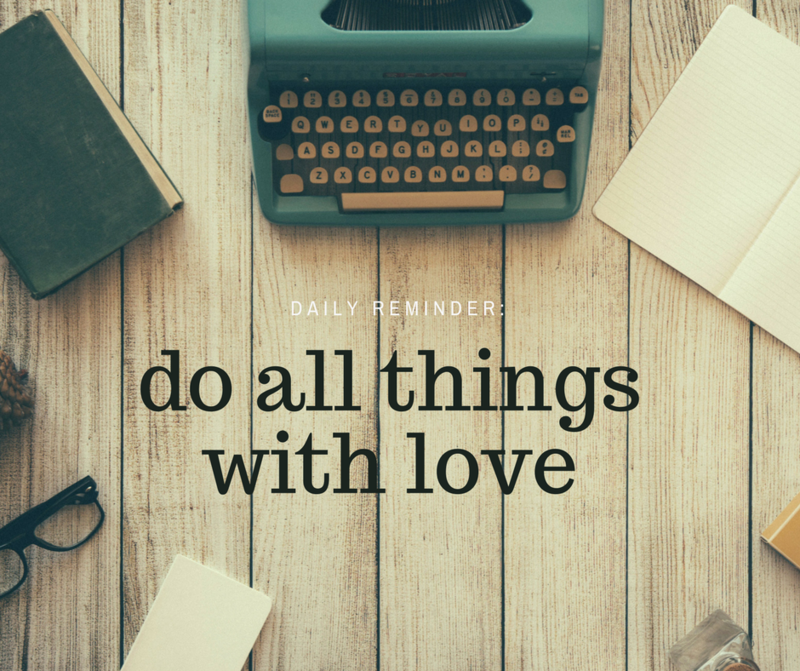 Love every time sheet, every tax form, every proposal, every call. And if you can’t find it in your soul to do that, get out of the way and make room for someone who can.